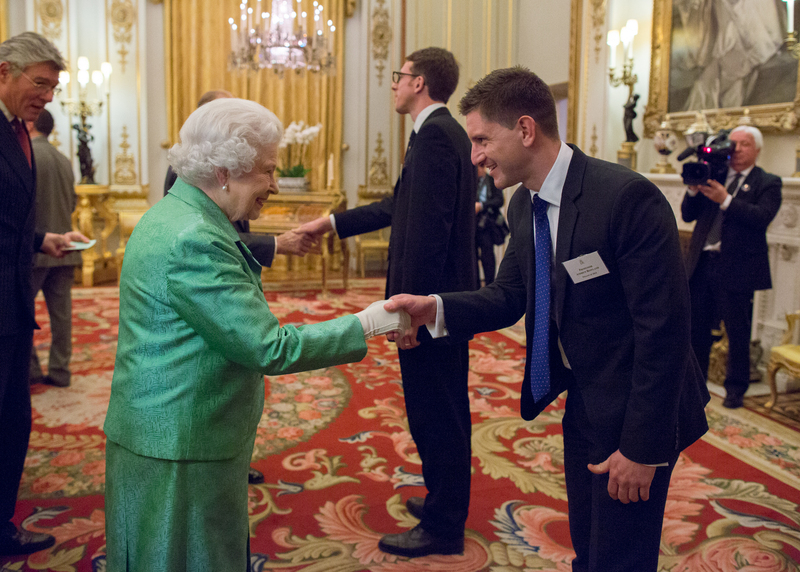 Professor Andrew Rowland attended a Reception at Buckingham Palace, hosted by Her Majesty The Queen on Wednesday 18th March 2015. Andrew is Consultant in Paediatric Emergency Medicine at North Manchester General Hospital (part of The Pennine Acute Hospitals NHS Trust), Honorary Professor at the University of Salford, and a Churchill Fellow (2014). The Queen, who is patron of The Winston Churchill Memorial Trust (“The Trust”), hosted the event to mark its 50th anniversary as Sir Winston Churchill’s living legacy. Professor Rowland was introduced to Her Majesty the Queen, His Royal Highness the Duke of Edinburgh and His Royal Highness Prince Michael of Kent as well as to one of Sir Winston Churchill’s Grandsons and members of the House of Lords who were in attendance at the Reception. Professor Rowland said, “Being invited to Buckingham Palace and having the opportunity to discuss my Living on a Railway Line report with Her Majesty the Queen, His Royal Highness the Duke of Edinburgh and His Royal Highness Prince Michael of Kent was a great honour and a truly wonderful experience that I will never forget. “My report is aimed at improving the protection of children in the UK and beyond. Coincidentally, the Reception was held on National Child Sexual Exploitation Awareness Day and this is a good opportunity for us all to remember that it is communities that are best able to protect children from exploitation and other forms of abuse. We can all do more to protect the most vulnerable members of our society. Last week Andrew also announced the launch of a new three-year Global Partnership between The Pennine Acute Hospitals NHS Trust, the University of Salford and M’Lop Tapang, a local non-profit organisation that works with over 4000 children and families living on the streets of Sihanoukville in Cambodia. Fellows from every decade since 1965 represented the Trust at the Reception, as well as representatives from The Winston Churchill Memorial Trust in Australia, and the Winston Churchill Foundation of the United States. To mark its semi-centennial, The Trust has just awarded a record number of 150 Travelling Fellowships – investing at least £1.3m in British citizens. This year’s Fellows will travel to 58 countries between them, across six continents, where they will carry out a wide range of projects. Jamie Balfour, Director General of The Winston Churchill Memorial Trust, said: “We were delighted and honoured that the Queen hosted a reception to mark our anniversary year. Sir Winston’s legacy lives on through our Fellows – individuals who, like him, have vision, leadership, a passion with a purpose, and a commitment to help their fellow citizens”. The Pennine Acute Hospitals Trust serves the communities of North Manchester, Bury, Rochdale and Oldham, along with the surrounding towns and villages. This area is collectively known as the North-East sector of Greater Manchester and has a population of around 820,000. It is a large Trust with a total operating budget of over half a billion pounds. Its main commissioners are NHS Bury, NHS Heywood, Middleton and Rochdale, NHS Oldham and NHS Manchester. Since its inception in February 1965, The Winston Churchill Memorial Trust has awarded over 5,000 Travelling Fellowships to British citizens, from over 100,000 applicants. The application process is highly competitive. The ethos remains the same five decades on – for individuals to visit different parts of the world in pursuit of new and better ways of tackling a wide range of social, environmental, medical and scientific issues, in order to bring back new approaches and innovative ideas to Britain, for the benefit of their local and regional communities, and, in many cases, the nation. Professor Andrew Rowland, Honorary Professor at the University of Salford, Consultant in Paediatric Emergency Medicine at North Manchester General Hospital, and a Churchill Fellow of The Winston Churchill Memorial Trust, has joined the Board of Directors at M’Lop Tapang for an initial period of three years as an unremunerated, voluntary appointment. The main goals of the partnership are to share clinical expertise as well as knowledge of child protection issues between the partnership organisations so that all three can develop and learn new skills from one another. As a board member Professor Rowland, who will become registered with the Cambodian Medical Council later this year, has committed to travelling to Cambodia twice per year for five days at a time to undertake mobile medical clinics with the staff at M’Lop Tapang. He will also do some educational work around the recognition of sick children and safeguarding vulnerable children. The partnership, which has not had any financial impact on The Pennine Acute Hospitals NHS Trust, was agreed following Professor Rowland’s visit to Cambodia last year as a Churchill Fellow. Two student midwives who are based at North Manchester General Hospital, Janine Cadd and Melissa Maclennan, will travel to Cambodia later this month to meet with M’Lop Tapang representatives as part of the new partnership. “This partnership brings fantastic opportunities for organisations to learn from one another so that we can all contribute in a far greater way to making our communities much better places for children to live and develop in the future. We stand to learn a huge amount from M’Lop Tapang, which provides children and families living on the streets and beaches of Cambodia with much needed shelter, medical care, education, training, counselling, family support and protection from all types of abuse. “I will use my experiences of the way that M’Lop Tapang deals with child protection cases as well as acute illness in a pragmatic way to better inform the way we provide care to patients here at the Trust. This will be vital to help us to develop a ChildSafe model in the UK and there will be many valuable opportunities for us to work together on joint-research and educational projects. The University of Salford has recognised the partnership by awarding Honorary Lecturer posts to two staff from M’Lop Tapang: British nurse Maggie Eno MBE, co-founder and coordinator of the organisation, and local Medical Team Leader, nurse Ngov Chanrary. In addition to formal acknowledgement of the importance of the work undertaken by these nurses, the appointments provide access to the University’s wide-ranging electronic resources and links to specialist nurses and social workers in the School of Nursing, Midwifery, Social Work & Social Sciences. “This exciting three-way collaboration allows each of us to share our best practices, all of which were developed from extremely different settings. “M’Lop Tapang has learned to be extremely resourceful in its approach to protecting large numbers of vulnerable children; we do this through making health care easily accessible in the community, and by ensuring that the whole community takes responsibility for safeguarding its children. “However, we lack access to high quality medical information and other much needed expertise. The team at North Manchester General Hospital are already providing us with vital technical support on challenging medical situations through regular Skype clinics and bi-annual follow up visits. “The collaboration with the University of Salford will allow us to improve our knowledge through shared learning, gaining support in conducting research and accessing academic studies that are not yet available in Cambodia. “This unique, open partnership offers mutual benefits to all of us, sharing and using each other’s expertise that will result in improved services to children across the globe“. It is a large Trust with a total operating budget of over half a billion pounds. Its main commissioners are NHS Bury, NHS Heywood, Middleton and Rochdale, NHS Oldham and NHS Manchester. 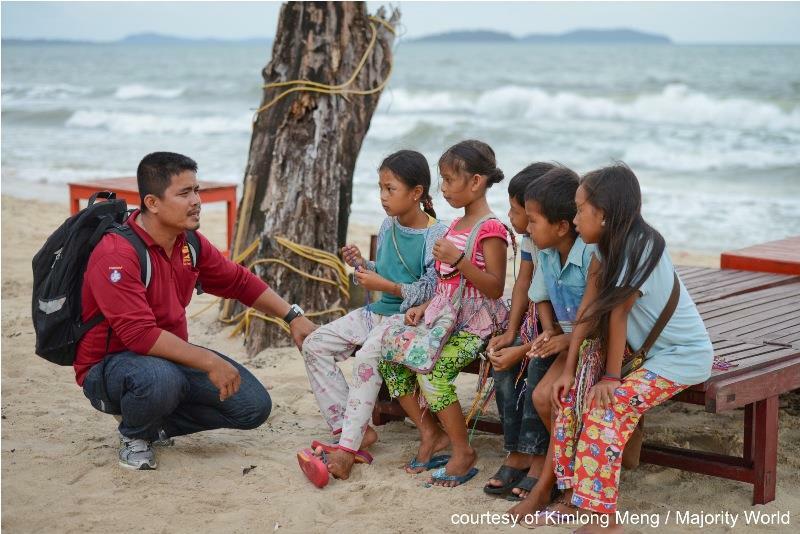 M’Lop Tapang, a local non-profit organization, has been working with the street children of Sihanoukville, Cambodia since 2003. Our Vision: M’Lop Tapang envisions an environment where all children are allowed to grow up in their families feeling safe, healthy and happy; a society where all children are respected and treated equally; a community where all children are given choices about their future. Our Mission: M’Lop Tapang strives to provide a safe haven for the street children of Sihanoukville, offering care and support to any child at risk. We offer access to education, reintegration with families, life-skills training and creative and recreational activities, while ensuring protection from all forms of abuse. Our efforts allow underprivileged children to embrace their childhood so they can become responsible adults as well as positive, independent members of society.